Pulsair designs and manufacture custom aerobic wastewater treatment plant mixers that help offer supplemental mixing to aeration basins and tanks outfitted with fine bubble/course differs. Why do I need a supplemental mixing system in an aeration basin if I already have diffusers doing the mixing? Answer: There is ZERO mixing happening below the diffusers and bottom of tank. 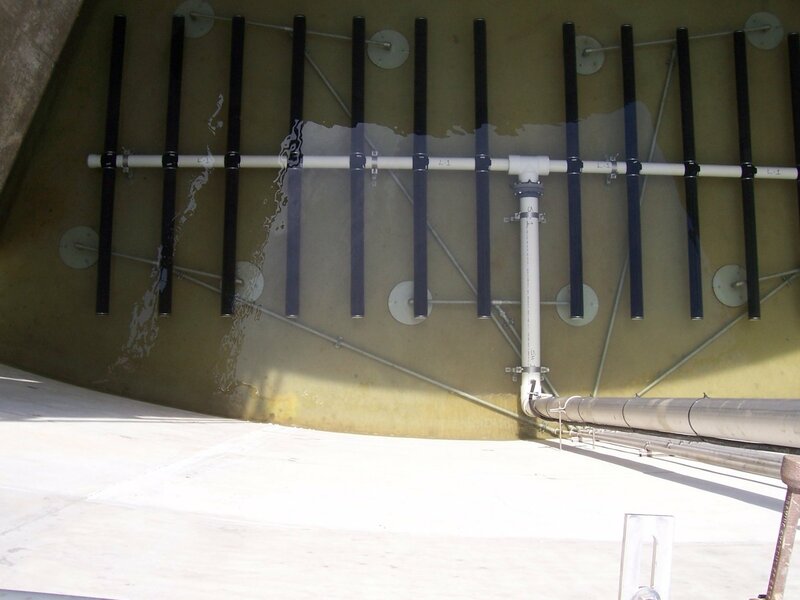 Diffusers are typically installed 12-24″ inches above the bottom of the tank floor. There is no mixing happening below the diffusers and over time, the tank will lose capacity and sludge will accumulate below the diffusers. Long-term build up of sludge will foul up the wastewater chemistry in the tank resulting in additional and costly water treatment methods in order to overcome the chemical imbalance in order to achieve the aeration treatment mixing goals. Pulsair uses round open plates that sequentially release time pulses of compressed, pressurized air that shoot out horizontally on the tank floor that scour and agitate the settled solids on the bottom. These solids are then swept up above the large bubbles and sucked up underneath and pulled to the liquid surface. This mixing process is fast, energy efficient and requires zero in-tank maintenance. The aerobic wastewater treatment plant mixers is a process in which bacteria consumes organic matter and converts it into carbon dioxide. The energy costs incurred when adding oxygen to this aeration process make this one of the more expensive wastewater treatment phases. 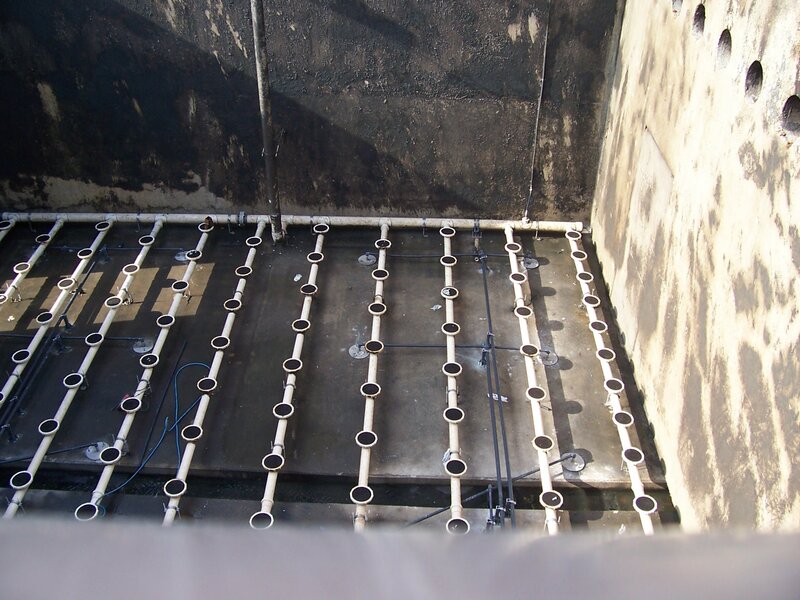 Typically diffusers are installed on the tank floor where they release fine or coarse air bubbles. Pulsair mixing systems are ideally suited for this type of process because of the vertical mixing motion that occurs. This type of mixing maximizes contact between water and oxygen thus accelerating the aeration process and reducing overall costs. 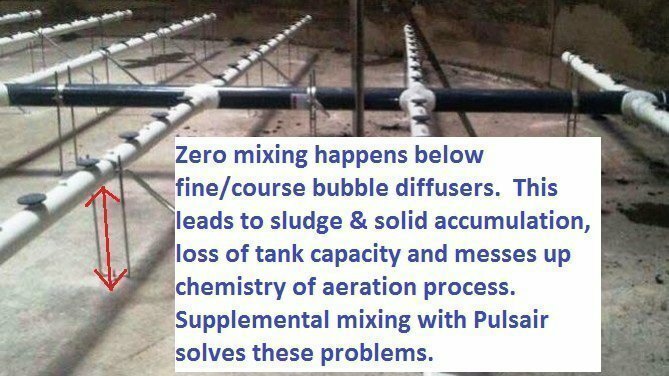 Pulsair provides supplemental mixing in a 200 ft x 75 ft aerobic aeration tank in video below Submersible impeller mixers were pulled out in favor of Pulsair. The video show the Pulsair in operations with the diffusers turned off. The customer would never be able shut off diffusers when they had submersible mixers in the past because too much solids would accumulate on the tank floor. The submersible mixers were only pushing the solids horizontally across the tank. It was very inefficient, a waste of money and resulted in ineffective mixing when the submersible mixers were installed and operational.